Farming Supplement of the Irish Independent – 15/07/2015. 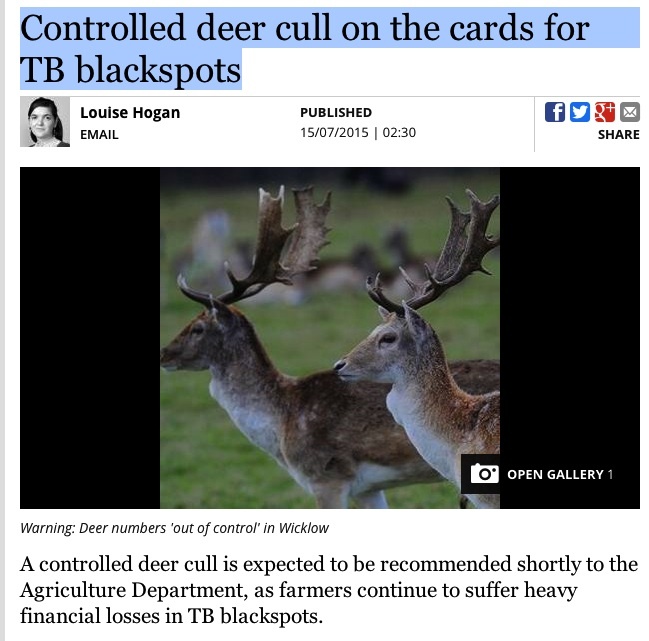 A controlled deer cull is expected to be recommended shortly to the Agriculture Department, as farmers continue to suffer heavy financial losses in TB blackspots. Chris Fox, a farmer and councillor sitting on the Irish Deer Management Forum, warned deer numbers were now “out of control” in Co Wicklow. A pilot study of the carcasses of over 100 deer in the county found 16pc had tested positive for the bacteria behind TB or tuberculosis. Shane O’Loughlin, a farmer in Aughrim and the head of the ICMSA Wicklow branch, said farmers in the area were seeking a deer management strategy with farmers suffering high losses due to positive TB tests in the county. “My farm hasn’t been locked up now in about three years but I went through about three years where I was locked up regularly,” he said, adding deer were now frequently sighted in the county. Cllr Fox said the initial findings from the draft recommendations of the forum were that a reduction in density of deer would likely have a positive impact on both TB in cattle and also in the deer herd. Cllr Fox said some dairy farmers have suffered dramatic income losses after losing more than 100 dairy cows. “They are adequately compensated for the loss of the animal but not the loss of the milk,” he said. The number of TB reactors has fallen from under 30,000 in 2008 to 16,000 in 2014. Agriculture Minister Simon Coveney said the incidence of the disease in herds has fallen from 5.9pc in 2008 to 3.6pc or 4,111 herds impacted last year. “The counties where the incidence of TB is significantly above the national average include Wicklow, Westmeath and Wexford,” he told TD Noel Coonan in the Dáil. 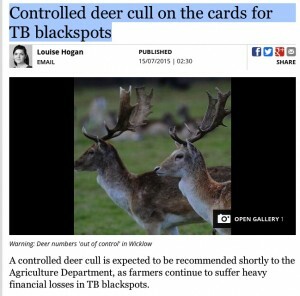 Mr Coveney said the department was still analysing the results of a survey on the incidence of TB in deer in Wicklow.